I was coaching a client last week. She’s a Process Professional in the Midwest of the United States who mostly works for not-for-profits in a variety of roles (facilitator, coach, instructor, etc.). She does awesome work for public service providers who do important and needed work in their region for a variety of populations. 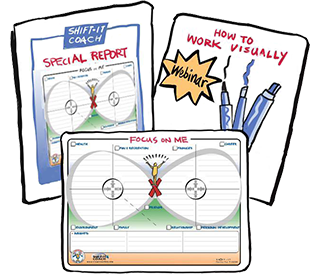 Last season she took the online version of my Fundamentals of Working Visually course, given there isn’t much training in Graphic Recording and Graphic Facilitation available in her geographical area. 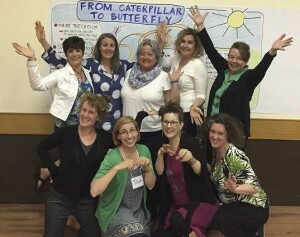 She was inspired by the experience and wanted to keep her momentum rolling so she traveled to British Columbia, Canada to attend my recent Magic Marker Retreat, the advanced visual skills course. As a Deluxe purchaser, she has 3 follow-up 45-minute sessions with me as part of her package, which we do by web conference (so we can see each other plus the digital tablet I’m scribing her visual notes on). On the list of items, she wanted to discuss was her decision to attend the upcoming conference of the International Forum of Visual Practitioners and any guidance I might offer. 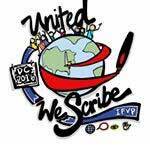 This is an annual gathering of visual practitioners (scribes, recorders, facilitators, coaches, etc.) who one way or other use visual methods in their practices (or want to!). Being someone who was there back in the day when it was formed in the San Francisco Bay area, it’s amazing to see it going strong beyond two decades now! I was really glad to hear this client had made the decision to go and was impressed given her decision was on the heels of having just made two prior investments very recently. Not everybody has the consciousness to do this, especially when it’s a stretch in finances, time or skill set. However, both her and her spouse value her interest in the visual way of working and want her to get up to speed as quickly as possible. Having myself invested in a lot of training, coaching and multiple industry events in the various networks I’m connected to, I personally know the importance of making good strategic moves in your business and personal development. And it’s something I advocate for with my clients who are serious go-getters. 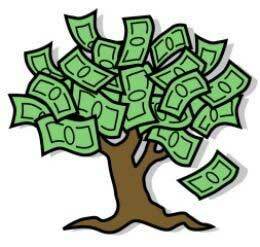 Money, unfortunately, does not grow on trees (darn it!) so it’s really important to invest wisely in the things that will truly grow your skills and connections. And sometimes when making these kinds of investments there is initially a mixed feeling of nervousness and excitement. Did I make a wise choice? Is this really going to benefit me? Will it help me shift myself, my practice and my life in the ways I want? Now, it’s going to depend on the person, their background, and their drive but for most people serious about their process craft I can solidly say that my programs are a good investment. I offer good quality trainings, products and services. And if that person is motivated and applies themselves (and doesn’t let their inner gremlin win out) they will get a substantial return on their investment, and usually quite quickly. And, I also feel this way about attending the annual conference of the International Association of Visual Practitioners, at least once, if you are interesting in the visual way of working. I feel it’s worth it and will benefit you and your career. So here are a few others thoughts and tips if you are also contemplating going to the IFVP Conference … this year or in the future. I’ve attended a few of these over the years and I hear regular reports each season from my students who go. These are jam packed events filled with tons of stuff happening, so pace yourself and surrender to the fact that you will not be able to digest everything, so don’t even try. Take tons of pictures, videos, brochures, biz cards, etc. And know that you will chew all that content down later, in the weeks, months and even years ahead of you. IFVP covers a diverse field although the conference itself still tends to be Graphic Recording and illustration-centric (although there are interventions underway to attempt to balance with more process-oriented applications like change management, organizational development, various kinds of facilitation, coaching and the like … I wish them well!). This niche field is almost 40 years old now, however, it’s really hitting its stride and growing like crazy, due to various factors which I write about in other articles (see my extensive articles and audio page). Yes, going to a big conference it is tempting to run yourself ragged trying to attend every breakout that you want to see. However, time and time again my visual skills students tell me that the best thing for them about the conference was the people. And my own memories of this are very, very fond. 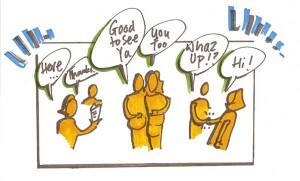 I still have good friends from the first IFVP event I ever attended and I value this longevity greatly. Yes, go to the breakouts and other segments that really attract you. But be sure to take advantage of the all the wonderful, like-minded and like-hearted people around you too. It’s often the unscheduled, spontaneous synchronicities that are best. Talk to the person seated next to you. Have conversations in the hallways. Go to meals (or out on the town) with other visual colleagues. This is where really valuable info trading, resources and sharing happens. And good friendships get made! For the consultants, facilitators, coaches and other Process Professionals … try to remember that you don’t have to be good at everything yourself. 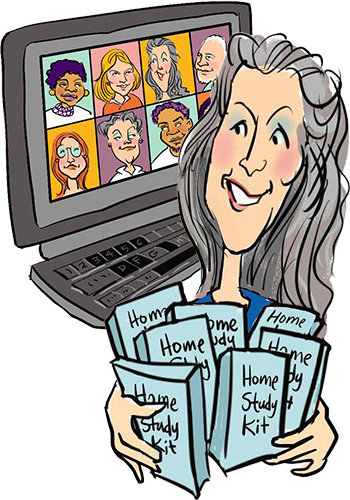 You can project manage your gigs and sub-contract the Studio Work and Graphic Recording pieces out to others who are more proficient at them. IFVP is a great place to talent shop for sub-contractors and other kinds of partners and collaborators. In closing, have fun and let me know how it goes. Even though I highly recommend them (especially if you have never been) I don’t attend every IFVP conference. I occasionally go so perhaps I will see you at an upcoming conference or one of my own events either online or in-person.